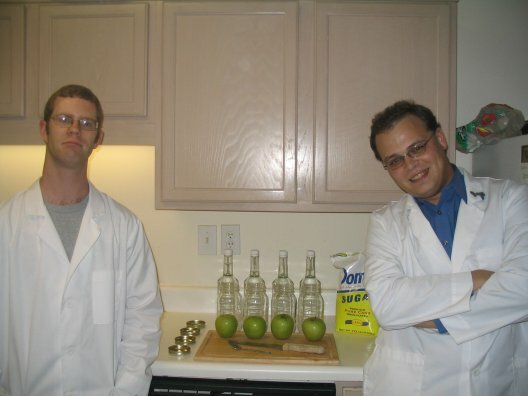 Once upon a time, the Mad Scienticians kept a bottle of Bärenjäger among our bar stock at all times. Though it was not used often, it was essential for a few occasionally-made drinks (as well as one ceremonial tradition). Though we have not had Bärenjäger on hand in some time, we decided to bring it back by creating what we hope will be a fair simulation of it: honey vodka. This experiment is quite simple; like our caramel and a few other vodka, it is not a true infusion, but either a solution or suspension (depending on whether the honey settles). In the absence of research to guide us in proportions, we used approximately 12 ounces of honey. 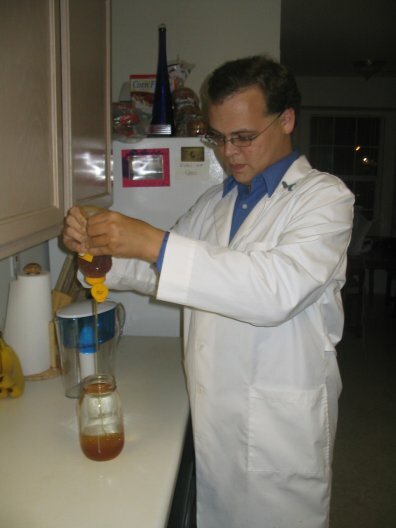 Wayland squeezed about half of this bottle of honey into a science jar of vodka. This experiment is unique thus far, in that we added the flavor ingredient to the vodka, rather than the other way around. The honey settled to the bottom of the jar as it poured in. 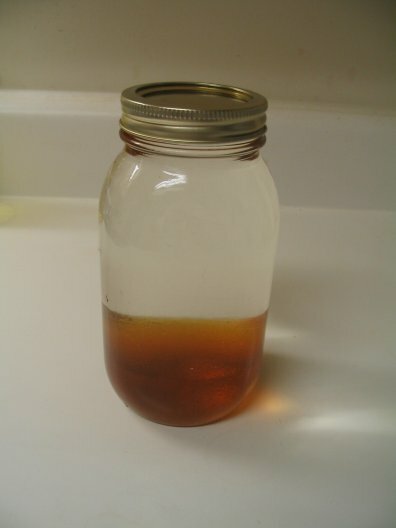 However, once we sealed the jar and gave it a good shake, it mixed together fairly evenly and seemed to stay that way. 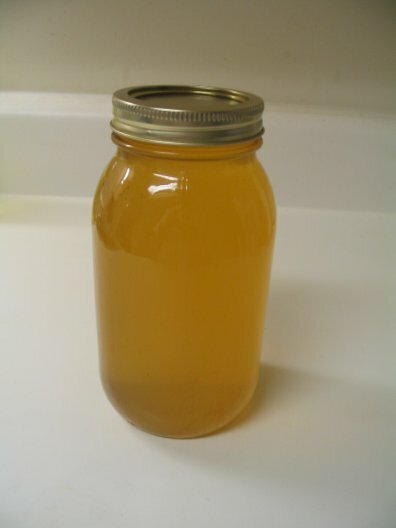 Wayland predicted that the honey would mostly settle out over time, like the caramel. Our friend Amy, who inspired our caramel experiment in the first place, predicted that the settling would be minimal, and that the experiment would be complete very soon. (I reserved judgement.) We will see how it looks in a couple of days. 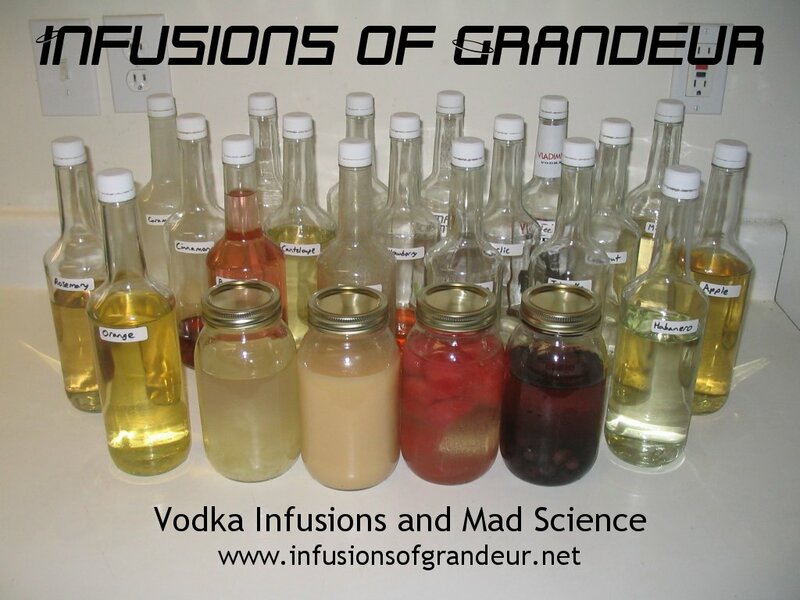 As of last week, we had four vodka infusion experiments ongoing at once, not counting the Big Experiment (which brought us to eight bottles, total). We recently tasted those four, and are proud to declare three of them successfully complete. Before we go into that, however, a note on the Big Experiment. 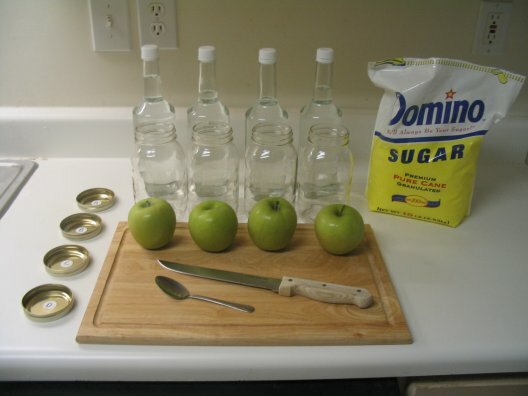 When we made our initial post, I wrote one batch of apple vodka would have the apple wedges replaced every three days, with a spoonful of sugar added with each replacement. A couple of readers expressed concern that the subsequent spoonfuls of sugar would add an unwanted variable to the experiment, since the corresponding batch whose apples will not be replaced will receive no extra sugar. We realized that they were right; there really is no reason to add more sugar to that batch of vodka. We have now replaced the apples in the appropriate vodkae twice now, and only added the initial spoonfuls of sugar. Now, on to the tastings. 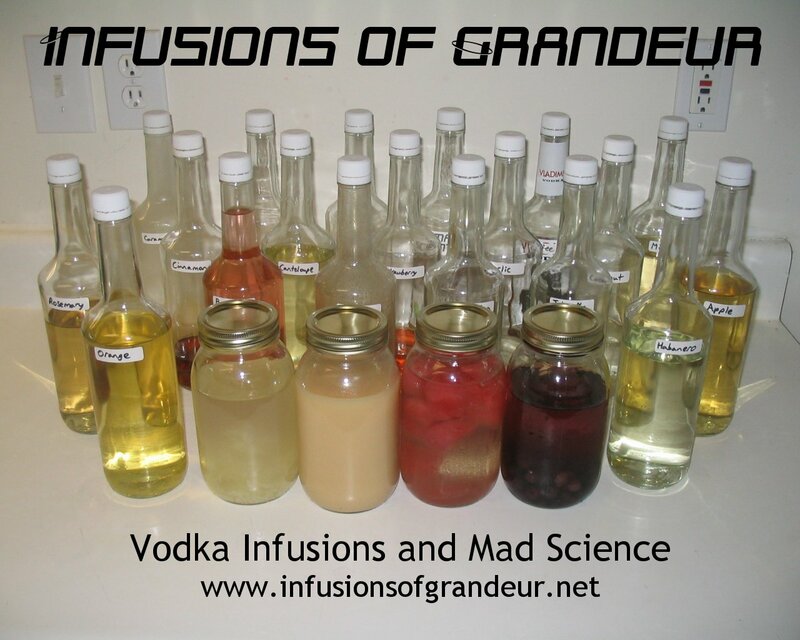 In this session, we sampled the blueberry, watermelon, ginger, and vanilla-caramel vodka infusions. The blueberry vodka looked about the same as it did last time; at this point, it had been infusing for 50 days, yet another record-crusher after the recent 39-day almond experiment. Though, to be fair, this was in part due to the fact that we skipped a week in our tastings. Brendan's reaction: "It has very much a blueberry taste, but with a heavy sourness around the edges. Fortunately, the sourness fades quickly. It could be better, but the taste is strong enough and close enough to call it done." Wayland's reaction: "I realized as we poured the shots that until now, my experience with blueberries has been limited to faux-blueberries in frozen goods, so I can't judge how close the vodka's flavor is to the real thing. This shot starts off very smooth, with a nice flavor. It's a little rough on the back end; not a vodka burn, and not a fruity flavor, just a little off. Thankfully, the sensation doesn't linger." We decided that the blueberry vodka was a success, despite its shortcomings, and bottled it. The watermelon vodka had infused for 31 days as of this tasting. The flavor, though still not very strong, has intensified since the last tasting. Wayland's reaction: "I think it's done. I don't know if we'll ever get a specific 'watermelon' flavor out of it, though it definitely has a general melon flavor. It's very smooth; it almost reminds me of Midori on a certain level, though this doesn't have the same twang." Brendan's reaction: "The flavor is, like a watermelon fruit, light and sweet. It also has a tinge of sour, but it isn't enough to bother the overall taste. I don't think the flavor is strong enough to hold its own in a cocktail, though that remains to be seen. It is tasty on its own, though, and I don't think the flavor is going to get any stronger." The ginger vodka clocked in at 22 days as of the tasting, much closer to the lifespan our research stated it would take. At the previous tasting, you might recall, the infusion was only four days running. Brendan's reaction: "The flavor is much stronger than last time. In fact, the taste is now stronger than the spice, to the point where the spice is almost hard to detect; though it certainly still exists. It's nice, but I think a little more time will make it even better." Wayland's reaction: "It definitely has more flavor than last time. It's interesting; like the blueberry, though, I'm not sure how much exposure to ginger I've really had, other than ginger ale and gingerbread. The vodka has both a touch of spice and a touch of sweetness to it. I like it as it is, though I'll defer judgement to my fellow scientician on whether it needs more time." We're giving the ginger vodka another week and re-sampling. This is the only experiment we sampled that wasn't ready for bottling. Our final tasting of the night was our vanilla-caramel vodka. It was a foregone conclusion that this one would be ready within a day or two after stage two, since there were no ingredients remaining to remove; we only needed to wait for the caramel cubes to dissolve. Whether the two flavors would marry successfully, however, was up for debate. After taking his shot, a big grin crept across Wayland's face. "This is excellent. Other than a bit of overpowering vanilla aftertaste, I cannot complain about this vodka. It's smooth, creamy and sweet. Most of our cocktails require some sort of lower proof mixer to make them palatable, but I think this vodka could easily hold that position without lowering the proof of the drink. It's just that smooth." Brendan's reaction: "I think we got the perfect balance here. The vanilla and caramel flavors are both distinctive, yet they support each other in a very pleasant way. There's not much of a front end/back end interplay, it's just the two flavors all at once, which subside to leave a slight vodka flavor behind, but no burn whatsoever." The vanilla-caramel vodka was declared a rousing success, possibly one of our best yet. As for the blog formatting, I feel like this post was a little formulaic; I'll keep tweaking things a bit, in hope of preserving clarity without sacrificing entertainment value. Feedback is always appreciated; here at Infusions of Grandeur, nothing is shielded from peer review. When we realized that the six-month anniversary of Infusions of Grandeur was approaching, we thought long and hard about how to commemorate it. We came up with a few off-the-wall infusions, but decided that the best way to celebrate the occasion was to finally solve the greatest mystery of the project's history: how to really get apple-infused vodka right. 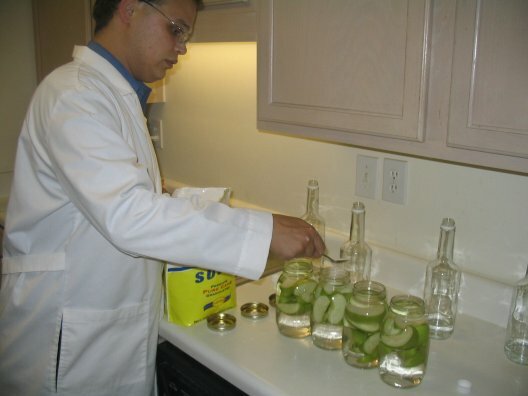 And it is appropriate that we do so, because apple vodka was one of our very first experiments. We have created two batches of apple vodka previously, with mixed results. 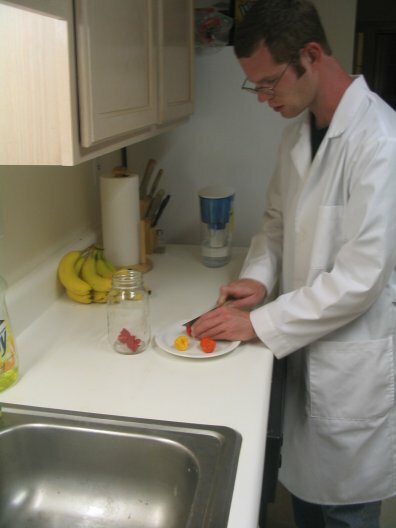 The original experiment, featured in our debut entry, involved a wedged apple and a spoonful of sugar in a non-refrigerated jar. Wayland enjoyed this batch, as did The Ferrett and his fellow tasters, but I was dissatisfied with it; I felt it tasted like apples that had been left in the open air for too long. So, we eventually created a second batch, tweaking our methodology. We suspected that leaving it at room temperature was a factor, so we infused the second batch in the refrigerator, but we did not use sugar this time. I liked the second batch better, though it was still not all I hoped it would be, and Wayland preferred the first batch. A while back, we received a comment from one of our readers, suggesting that we replace the apples periodically during the infusion. This should keep the apples at their freshest for as long as is needed for the infusion (both previous batches infused for two weeks). We have decided to put this method to the test. But to merely try a new method is not enough for this experiment; no, this time we are cross-testing four different methods, which will culminate in a scientific double-blind taste test. Same apple for two weeks, with a spoonful of sugar. Same apple for two weeks, without sugar. Apple replaced every three days, with a spoonful of sugar each time. Apple replaced every three days, without sugar. All four will be refrigerated during the infusion. There are other possibilities we could have included, such as peeling the apple wedges, but we decided that this experiment has enough variables as it is. The experiment began as I cut each apple into eighths, slicing away the core section of each wedge and discarding it. 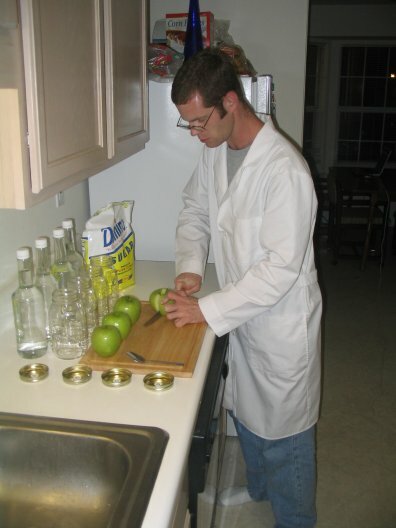 Once each apple was sliced and loaded into the science jars, we added the vodka. 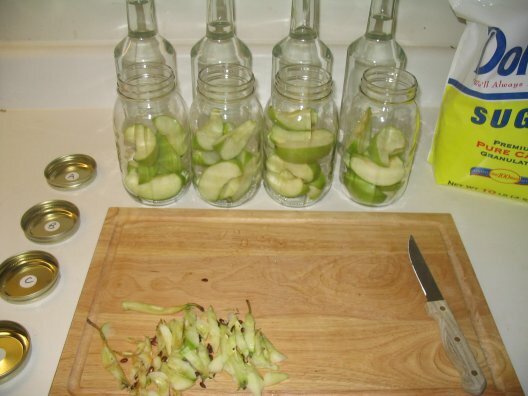 It seems that these apples are slightly larger than the ones we have used previously (perhaps due to the season), because each bottle of vodka had just a little bit left over after topping off the jars (and spilling some onto the counter in the process). 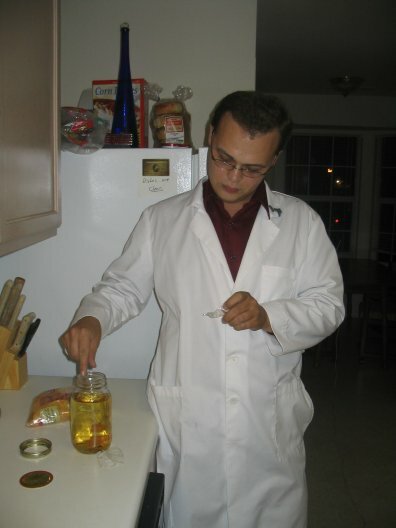 Wayland added a spoonful of sugar to two of the jars, taking care to remember which was which. Once the infusions were underway, we labeled each jar with a simple letter, storing the descriptions separately. This will allow for the double-blind test at the conclusion of the experiment. 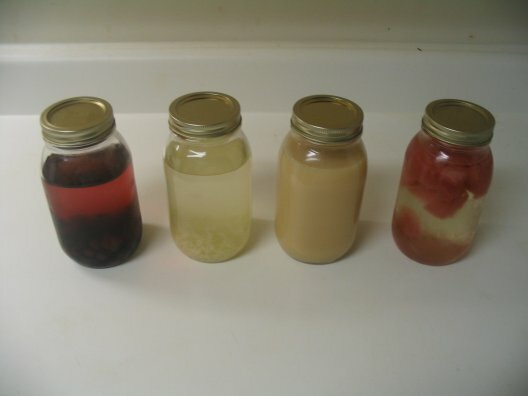 Then all four jars were stored in the refrigerator. 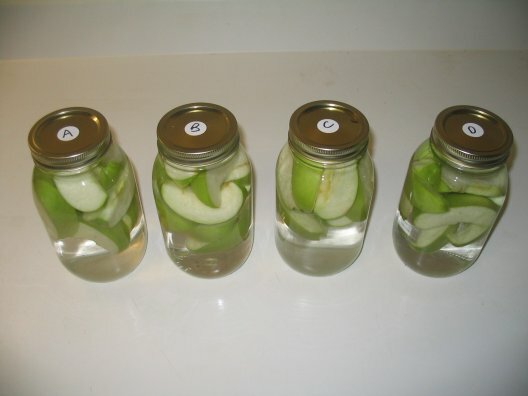 We will run this experiment for two weeks, just like the previous apple infusions. If scheduling conflicts do not prevent it (and that's a big "if"), we hope to present our results on the Fourth of July. Since we're sure all of our faithful readers are waiting with bated breath to see what our special six month anniversary experiment will be, we have decided to tide you over with this beauty: a photo of every vodka infusion we have in stock or ongoing. 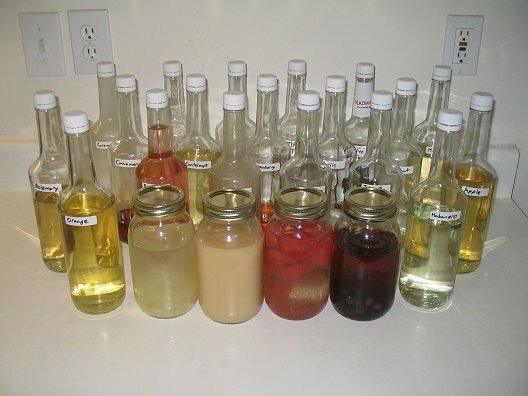 What you see here is nineteen bottles of infused vodka (in various states of fullness), as well as four continuing experiments. If you use a lower screen resolution than these, get with the times, folks. The Big Experiment (not shown, of course) is officially underway, as of an hour ago! We'll debut it Wednesday night, same bat-blog, same bat-feedreader! Last week, we began our first dual-stage vodka infusion, vanilla-caramel. We started with a standard vanilla infusion, with the intention of adding caramel after the vanilla bean was removed. It probably would have worked just as well if we added both ingredients at once, but the caramel-clouded vodka would make it more difficult to extract the vanilla bean. The vanilla infused for five days. Once the bean was removed and discarded, Wayland began adding caramel cubes. Lately, we've been using 12 cubes for caramel vodka, but we decided to go back to our original 8 cubes for this experiment, to prevent the vanilla from being overpowered (as it was in our strawberry-vanilla combination). If we want, we can always add more caramel later. 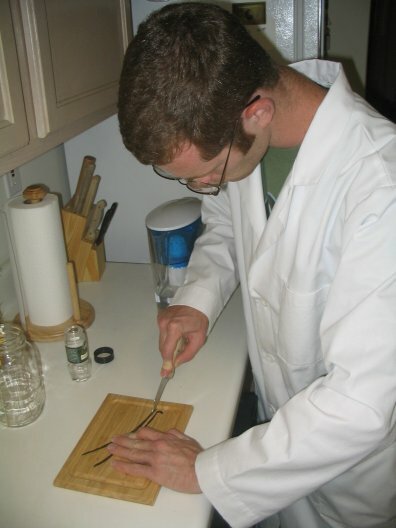 Wayland, who studies under the Robert D. Raiford school of cooking, samples the caramel to ensure it is of the highest quality. Additionally, today marks the six month anniversary of Infusions of Grandeur. In celebration of this auspicious occasion, our experiment for this week will be our most ambitious to date, and will bring the entire project full circle. Stay tuned! Today's post is dedicated to the loving memory of Don Herbert, a.k.a. Mr. Wizard. After three days of infusion, our habanero vodka experiment was ready for tasting. 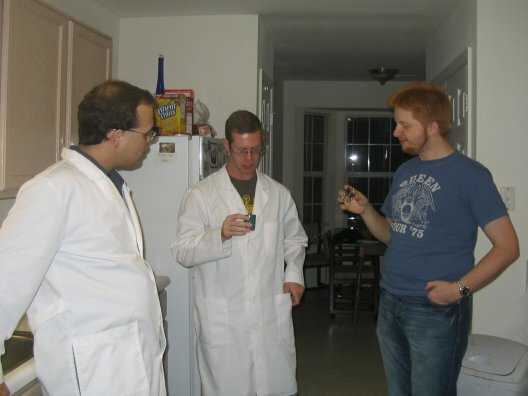 We invited our friend Jason, a fellow capsaicin addict, to the lab to sample it with us. We have previously created jalapeño infused vodka. That infusion was fairly spicy on the back end, though not overwhelming. Habanero peppers are around 40 times hotter than jalapeños, according to the Scoville scale. We used four habanero peppers, as opposed to the two jalapeño peppers from the previous infusion. Both infusions ran for the same amount of time. These factors should give you an indication of just how hot we were expecting this vodka to be. As much as we love spicy foods, the only one who was not at least little nervous about it was Jason. It didn't seem fair to make anyone go first, so we poured three shots and sampled them all at once. In the eloquent words of Professor Hubert Farnsworth, "Oh my, yes." The vodka knocks you for a loop, but not maliciously. It's actually quite bearable, if you enjoy heat; though if you're not a fan of capsaicin, I would suggest steering clear. The heat is significantly more intense than the jalapeño vodka, hits more quickly (though not immediately) and sticks around longer. Beneath the heat, the vodka has a crisp, almost sweet flavor. "It starts out pretty smooth," Wayland remarked. "Actually, for the first two seconds, it didn't seem like it was going to be spicy. Then it grows past mild to a pretty strong burning sensation." He added that you would pay the next morning if you had several shots. We consider this experiment to be very much a success. We're excited about the possibilities for using the habanero vodka, though we have not created any cocktails (or marinades) with it as of yet. 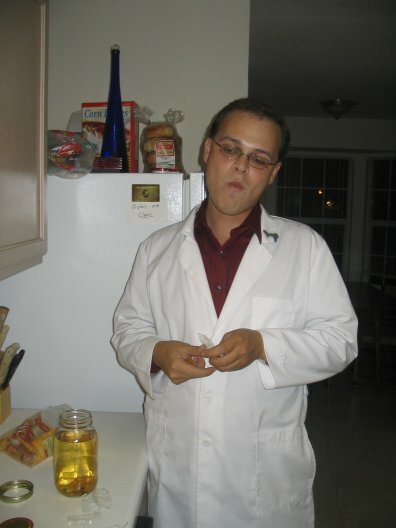 We Mad Scienticians are spice fiends. There really is nothing like the brief endorphin high that comes from really hot salsa or chicken wings, and it's legal to boot. 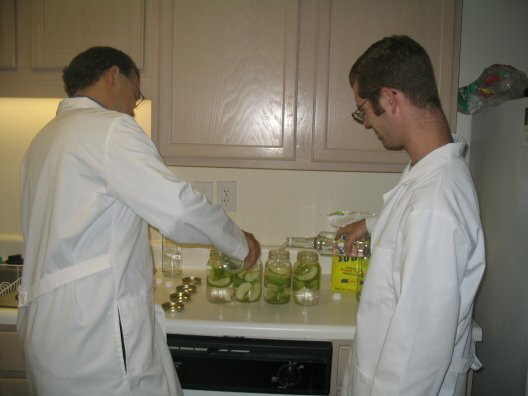 Therefore, three months ago, we conducted an experiment in creating jalapeño-infused vodka. Though we do enjoy the heat, we were a bit wary of it at the time, not knowing exactly what to expect from it. As it turned out, it had a good kick to it, but was still relatively mild. Though we've used the jalapeño vodka in a few drinks, we primarily use it as a marinade. 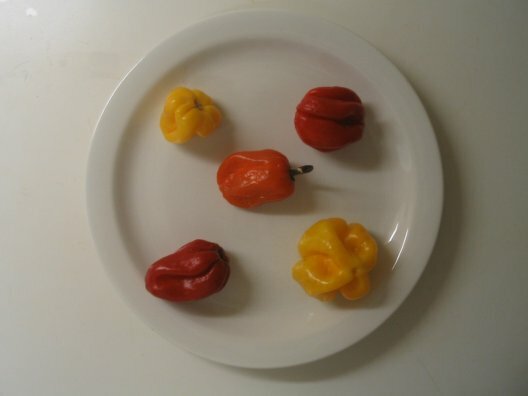 This week, we decided to try pushing the limits a little further, and picked up a few habanero peppers to infuse. Habaneros are the hottest chili peppers generally available to most consumers, with a Scoville rating of 100,000 to 350,000 Scoville units (a measure of a pepper's heat). In contrast, jalapeño peppers rate 2,500 to 8,000 Scoville units. Pure capsaicin, the chemical which causes the heat sensation, rates 16 million Scoville units, the maximum rating possible. I cut each habanero in half, just like we did with the jalapeño vodka. Notice that we used twice as many peppers for this infusion than for the jalapeño. This will be another fast infusion; the jalapeño vodka only took three days. 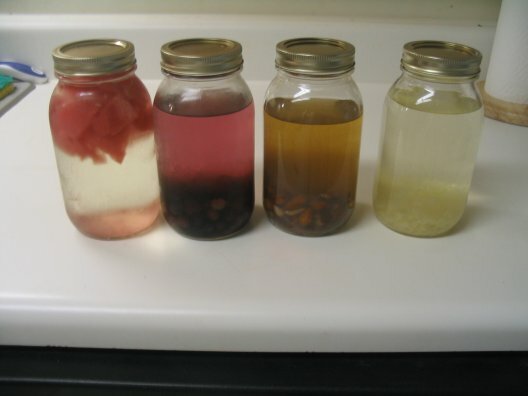 Last night, we conducted our initial test of last week's ginger infused vodka experiment, as well as secondary and tertiary tests of our watermelon, blueberry, and almond vodkae. 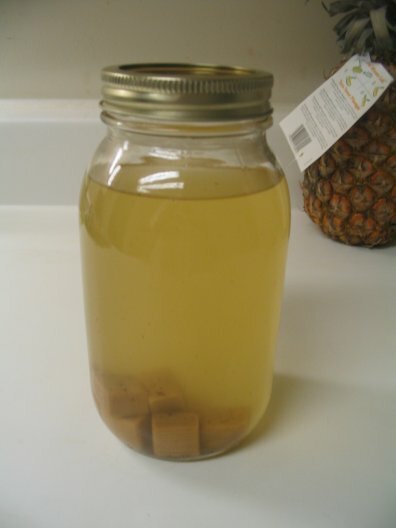 I was looking forward to the ginger vodka, having received several favorable comments about other people's ginger infusions both on and off this site. I'm a fan of ginger in general, and it seemed to me that, unlike rosemary, it was likely to mingle well with the kick of vodka. So you can imagine my surprise when I tipped back my shot, and it tasted.... not right. There was no spice, and the flavor was way off, though I couldn't quite put my finger on how. I blinked a few times and tasted a little bit more, but it was no more enlightening than the first taste. How could this infusion have gone so wrong? What did we do? Was grating the ginger root the wrong approach? I began discussing my thoughts with Wayland. "Dude," he said to me, "that was the almond vodka." I stared blankly for a few beats. "Oh. ...Well, in that case, it's pretty good." Wayland took his sample, and we agreed (now that I knew what taste I was looking for) that the vodka tastes very much like almonds. It's very smooth, with almost no vodka burn. The almond vodka was finally a success, after 39 days of infusion - a new record, just beating coconut's 35 days. We bottled it, using a doubled-up layer of cheesecloth to catch some of the dust. After this debacle, I had to try the real ginger vodka next. Though we expected to reduce the infusion time by grating the ginger rather than slicing it, four days was not nearly enough. The vodka had attained some of the spice of the ginger, but almost none of the flavor. The vodka taste was mostly neutralized, however. "It has a very slight ginger flavor on the back end," Wayland said, "but there's really not much there yet." The watermelon vodka was on Day 13 for our second tasting. The flavor has progressed since the previous sample, but I still didn't find it to be a very strong flavor. There was also a significant amount of vodka taste, but it's not harsh. "It's definitely got a melon flavor, but it's not distinctive as watermelon," Wayland commented. "Fairly smooth, but with a slight burn." He added that he didn't expect to get much more flavor out of it, but I am still optimistic. The blueberry vodka, likewise, has attained more flavor than last week, but not very much. I found the blueberry taste to be overwhelmed by the vodka, with a very slow-acting vodka burn. Wayland, on the other hand, tasted almost no vodka flavor. "It's definitely fruity, with a slight tang of sourness. I'm not big on it, but the true test is in the cocktail." Wayland felt that it might be ready for bottling, but I wanted to give it a little longer. But wait, there's more! While digging through our science fridge, we discovered an ancient treasure: our grape vodka. As you may recall, this vodka was declared a flop in its final test, not actually bad, but with very little flavor attained. We intended to bottle it and keep it as a backup to our non-infused vodka. However, we completely forgot about it, and left the jar of vodka and grapes in the back of a refrigerator shelf. When we ended the experiment, the infusion had run 26 days, one of our longer infusions, though not quite in the league of almond or coconut. When we pulled it out yesterday, however, the infusion was a mind-boggling 75 days old. That's one-fifth of a year. We should have poured it straight down the drain and never looked back, but if we did that, we would be failing our reputations as Mad Scienticians. We knew we had no choice but to taste it. This decision may have been influenced slightly by the previous four shots of vodka per man. "I can't believe we're drinking this," Wayland said. "Of course, it was my idea." We poured two shots and drank. Wayland rather enjoyed it, describing it as "a sweet white wine flavor, like a Riesling." What I tasted, however, was not so pleasant. It was bad, but it was an odd kind of bad, not horrifying at all. It was as if the flavor approached me, creeping up along a darkened path, with claws drawn and fangs dripping, then shouted "boo!" in an effeminate voice and skipped away. We decided to bottle it. We're not sure what we'll end up doing with it, but we definitely want to get a third opinion before consigning it to its destiny.